Holy cow, I made sportswear! I really would not have thought this was possible, but it was actually — dare I say it? — EASY! 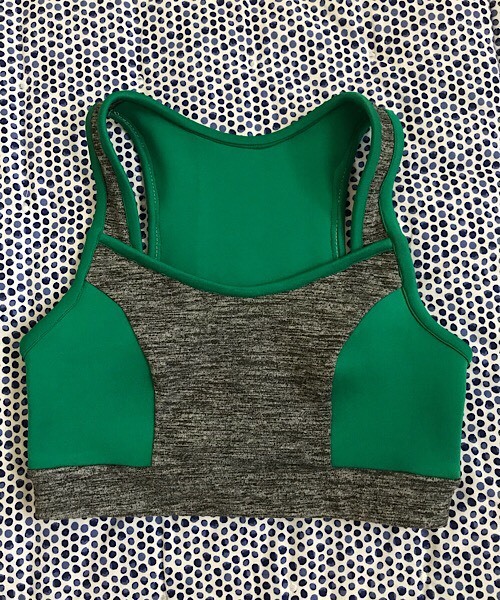 Best of all, I made this sports bra, ahem, yoga bra completely out of scraps! I always thought that effective sportswear required specialty stitches, notions, and fabric. Now that activewear fabric is available everywhere, turns out I was wrong about the other two. 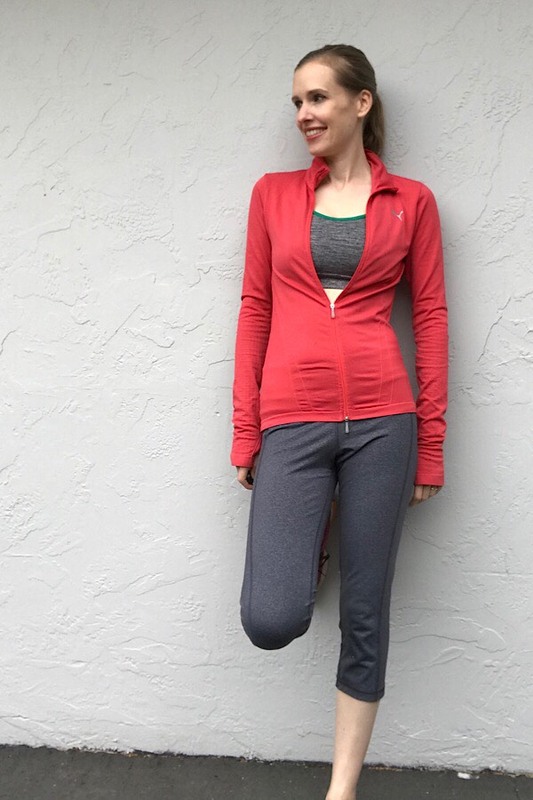 Plus, there is a way better range of activewear patterns from a variety of pattern companies. Time to put my old ideas aside and try something new! I went with Simplicity 8339, because it’s more traditional in its style, but has some customization options. (Must colorblock All The Things.) I didn’t necessary want a strappy, cool bra. I wanted something that felt substantial, and also that didn’t require making a ton of fussy skinny straps. Gross. I had a really enjoyable time sewing this bra up! The directions were clear, and the construction was not complicated. It was a bit fussy attaching bindings in thick activewear fabrics as the seams started to pile up, but not unmanageable. The pieces all fit together smoothly as drafted, and there weren’t any big hiccups, making this a quick project to whip up. I’m quite pleased with the look of the bra. 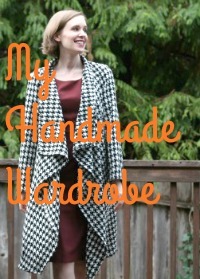 I have an outdated view that handmade sportswear will look, well… handmade. It’s just not true in this case. The bra is cute, well-shaped, and has great details and colorblocking possibilities. 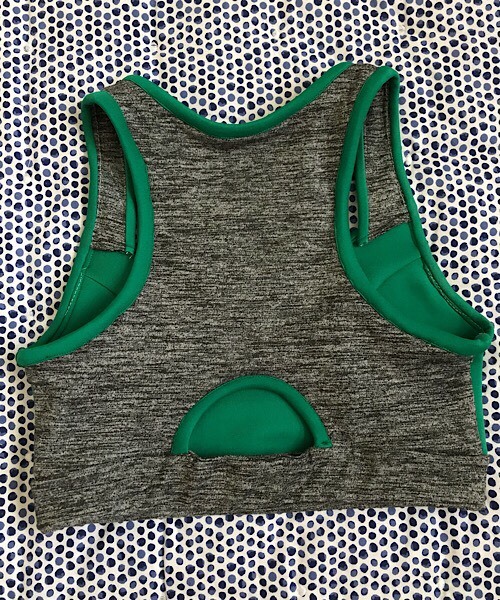 I may never pay for a retail sports bra again! 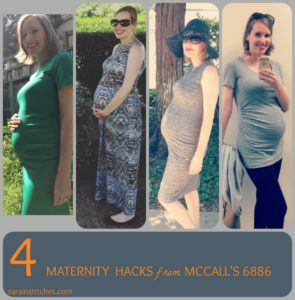 The fabrics I used are leftovers from my maternity dresses: green scuba knit and gray heather lycra/spandex/something-like-that knit. Overall, very little fabric is required here. If you go by the yardage listed on the pattern envelope, you’ll have enough to make multiples. If you’re at all interested in making yoga pants, leggings, etc, then consider just adding on a bit of yardage when you buy your fabric and you can probably squeeze a matching bra out of it. Simplicity also did a really good job of providing individual pattern pieces for each cup size. Plus, there are two sets for each cup size to accommodate all the band sizes. It’s not that unusual, just adds up to a lot of included sheets, of which you only use a small percentage. It also makes it easy to switch a size up or down after you try it. Having worked in product development, I can just imagine the designer/product team being super excited at a meeting, like, “Screw it! Let’s just include ALL the pattern pieces and give the customer exactly what they want! I don’t care how many extra sheets of pattern paper it takes — it’s going to be amazing!!! !” I also thought the directions for finding your cup and band size were explained well. Okay, but here comes the kicker. I’m not sure this bra really fits me all that well. It’s well constructed and everything, it just doesn’t have as much support as I was hoping for. My girls are squished in, and there’s a bit too much… bouncing. To be honest, I might just be more critical of things I make. 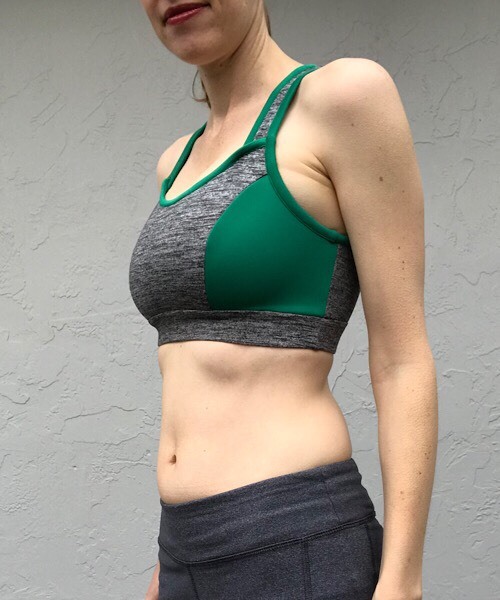 I keep meaning to try on one of my favorite sports bra and see if the bounce issue is something I just didn’t really notice and nitpick with my RTW bras. Now that I’m nursing, I’m much more aware of anything that’s harsh on the milk-makers. I think it’s a size issue possibly with the fabrics contributing, so I’m probably going to try this pattern again with a different combo (going up a band size at the very least). Again, there’s nothing inherently unsupportive in the design, but you do need to really nail your size. I might also try some power mesh for the lining. I haven’t worked with power mesh, but it seems to have supernatural powers. The one modification I made turned out to be a bit of a mistake. Two of the views call for an elasticized casing with hooks and eyes as a closure. I did not want to fool around with buying or installing specialty sporty hooks and eyes. Nope, not for me. So, I just made a continuous casing, which made the sewing part easier, but the actual getting-the-bra-on part much harder. Don’t do what I did. If you’re a C cup or over, you’re just asking for some painful squishage when getting this on. The other view (C) has just a straight-up elastic band attached. I’m loathe to source specialty elastic for one small piece, but I’m very curious to try this version. I just can’t with the hooks and eyes, so fingers crossed. In the end, you can see why I’m calling this a yoga bra. It’s cute, and perfect for gently bending over and reaching, which — I’ll be honest — is the only exercise I’m doing lately anyway. (I know it’s a myth that you can’t start working out again while nursing, but it’s a damn convenient myth, so I’m going with it!) I’m just really pleased with how the final outcome looks that I can’t bring myself to call it anything less than a success. Sometimes things just work out, right? Welcome to the closet, my Mostly Functional Fitness Foray! Well thanks for this review. Yours looks really great! It’s very impressive actually. I’ve got the pattern and I think it looks good, but I’m a G or F cup and not sure if it will be supportive enough for bouncing around. 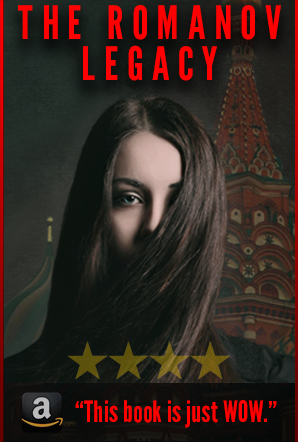 This is the first review I’ve seen so thanks… when I get time I’ll make it up and see how it goes. I usually wear a wired sports bra under my togs for aqua aerobics as even a bra in the togs doesn’t help. I don’t think it will be supportive enough for me but maybe it will be ok with a sports bra and just be a top. Thanks for the comment! Based on my experience, I think you’re on the right track — sew it up and just see how it goes without expecting it to be uber supportive. Maybe you’ll be pleasantly surprised! Either way, I hope it will be a fun project for you. I’m desperate to make this bra as I have the pattern but according to the pattern I measure a 28E (I usually wear 32C). What size do you measure under bust and what size did you make? You look tiny so just wondering how you got it to work when the smallest size is 30! Fantastic job on the bra btw, it looks so professional! Hi Debra! I measured a 30C according to the pattern (have been measured most recently as a 32C, but have since had a baby, so…), and found the 30 band to be a bit tight — that might also be because I left off the hooks and eyes on the band. Based on my experience, I think you might be just fine cutting a 30E. Either way, since it doesn’t take much fabric, I hope you give it a go and don’t have to do much tweaking to get a good fit! Also, there are separate pieces for each cup size, so you don’t have to worry about tracing off a size before cutting. Good luck!